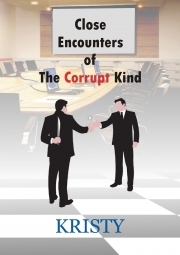 Description of "Close Encounters of the Corrupt Kind"
He searches for a company in line with his value systems and joins the most respected corporate house in India which, in public perception, is an epitome of ethical business conduct. But ………. He wears his idealism on his sleeves and becomes vocal. Consequently he is victimized by his corrupt bosses. Anguish leads to heart attack and bypass surgery at a young age of 35, almost killing him and his career. But ………. Exasperated, he enters academic field since education is the most honorable profession. But ……. Since the system hardly ever penalizes the corrupt, he goes about punishing each of his corporate tormentors. But ……..
Is he a failure in conventional terms? Or is he a success in real terms? Or is he a successful failure? Born in Pune (erstwhile Poona), he completed his schooling and engineering in New Delhi. He went on to obtain an MBA from Bangalore and Ph.D. in Management from the US. He has worked for two of the most blue chip engineering companies in India and reached top management levels excelling in Sales, Marketing, Strategy and Corporate Communications. He left the corporate world with 10 years of service still remaining and entered academics and consulting. He recently ended his working life as the Dean of a B School in Bangalore. He now lives a retired life in Bangalore with his wife. Reviews of "Close Encounters of the Corrupt Kind"